Developmental diapause has a significant role in the life cycle of many nematode species. The ability to pass through a dauer stage provides the ability to live for a longer time in a resilient form that is protected from many environmental stresses. Thus, diapaused larvae are well-suited for population dispersal and host infection. There is growing interest in developing biological control tools based on entomopathogenic nematodes that kill garden pests via infection. (DNemFIG 1A). For most parasitic nematodes, the dauer is the infective stage. 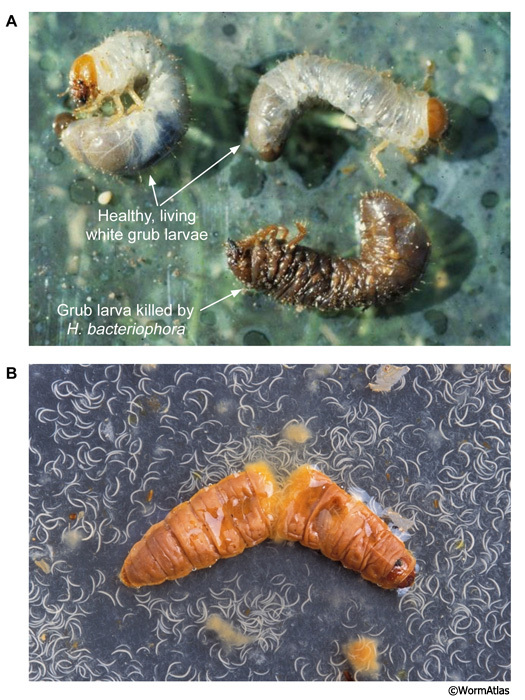 One problem in developing pest biocontrols based on nematodes is confirming that nematodes actually cause the death of the host, rather than just persisting as dauers until the host dies from other causes and then recovering from dauer to feed on the host carcass. This issue was investigated for the nematode Phasmarhabditis hermaphrodita, which is a parasite of the grey garden slug Deroceras reticulatum (DNemFIG 1B) (Tan and Grewal, 2001). When injected directly into the slug’s body, most developmental stages of P. hermaphrodita were lethal to the host. 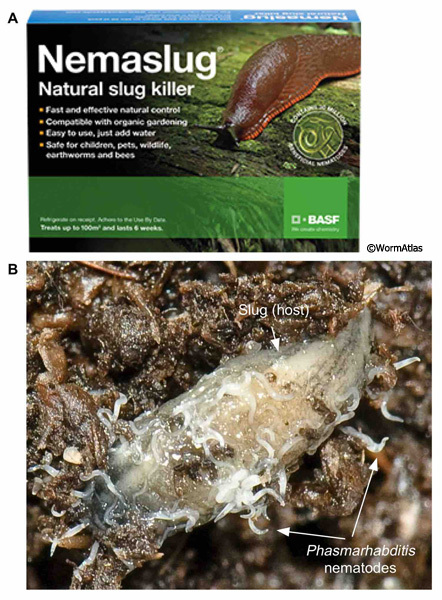 However, only dauers were able to infect living slugs from the exterior (Wilson et al., 1993; Tan and Grewal, 2001). Together these findings indicate that dauers are specialized for host infection, and once inside the host, this nematode species is pathogenic to the host. Heterorhabditis bacteriophora are insect parasitic nematodes that exist in a symbiotic relationship with the bacteria Photorhabdus luminescens (Ciche, 2007). These symbiotic bacteria are stored in the gut of the Heterorhabditis dauer larva. In the dauer stage, also known as the infective juvenile (IJ), this nematode species disperses through the soil searching for insect hosts. Heterorhabditis dauers can sense host insects directly or by detecting compounds released from plant roots damaged by insect foraging (O’Halloran and Burnell, 2003; Rasmann et al., 2005). Once a suitable host insect is found, the dauer perforates the insect’s exoskeleton using a specialized buccal tooth and then enters the insect host body. Once inside the host, the dauer regurgitates the Photorhabdus luminescens bacteria from its gut into the insect hemocoel where they grow, eventually killing the insect host (Ciche et al., 2008) (DNemFIG 2). The infective dauer recovers, reenters reproductive development and proceeds to produce progeny while feasting on the bacteria produced within the insect body (Strauch and Ehlers, 1998). The bacterium and the nematode act in a mutualistic manner to assist each other in feasting on this host, while the bacterium exudes toxic chemical signals to repel the entry or reproduction of other potential bacterial species (Bai et al., 2013). Cruising and ambushing are two different host search strategies that have been adopted by the entomopathogenic nematodes (Campbell and Gaugler, 1993). Nematodes that use a cruising strategy move about, exploring a large surface area in search of a host. Dauers of the species Heterorhabditis bacteriophora, Steinernema felitae and Steinernema glaseri utilize the cruising strategy to find their hosts, which are slow-moving grubs and insect larvae in the soil (Campbell and Gaugler, 1993). Nematode species that use an ambushing strategy spend relatively little time engaged in area searches and prefer to nictate with their bodies held off the surface, waiting to be carried off by a passing mobile host. An example of an ambush nematode is Steinernema scapterisci, which infects quick-moving mole crickets (Nguyen and Smart, 1990). 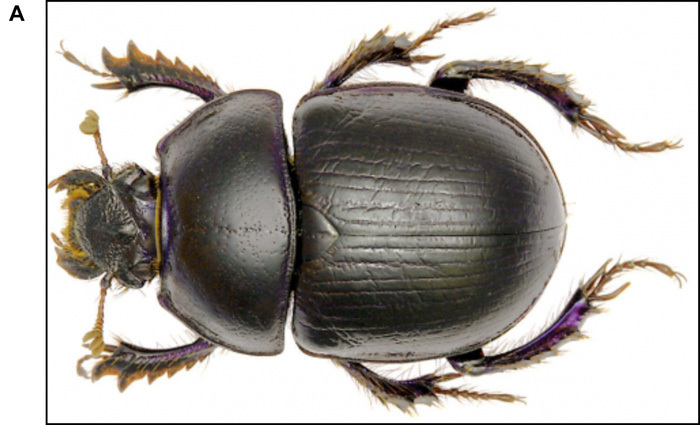 The Pristionchus genus, within the family Diplogastridae, includes several hundred free-living nematode species, many of which are found to be closely associated with scarab beetles and Colorado potato beetles (Sommer, 2006). One of the most well-studied Pristionchus species is P. pacificus. In the case of P. pacificus, dauer larvae are found exclusively associated with living scarab beetles (DNemFIG 3) (Meyer and Sommer, 2011). Upon the host beetle’s death, dauers recover and reenter reproductive development, using the beetle carcass as their food source. Studies have shown that dauer entry is triggered by a pheromone that acts species-specifically. Interestingly, some nematode species produce pheromone that acts more potently on sister species than on the self-species (Meyer and Sommer, 2011). Evolutionary pressure on pheromone specificity could cause precocious dauer entry in competing species and help defend against competition for scarce food resources. 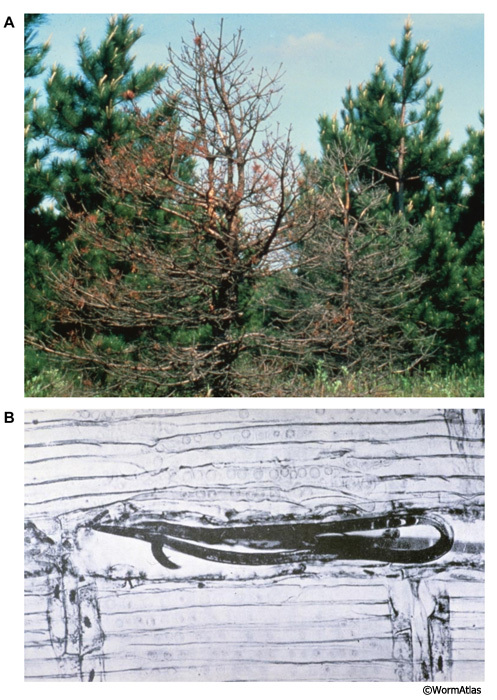 Bursaphelenchus xylophilus, also known as pine wood or pine wilt nematodes, are plant parasitic nematodes that cause pine wilt disease (DNemFIG 4) (Linit, 1989). B. xylophilus dauers enter the trachae of Monochamus beetles, which feed and lay eggs in pine wood. The beetle then carries the dauers to fresh pine branches where the dauers enter the wood at wound sites created where the beetle has fed or laid eggs (Linit, 1990). Once within the fresh wood, the dauers recover and proliferate, using the pine wood epithelial cells as a food source (Ferris, 1999). Thus the parasitic nematode species can cause devastation to an important agricultural product; this makes many of the parasitic nematode species very unpopular among foresters and farmers. Ferris, H. 1999. Bursaphelenchus xylophilus. http://plpnemweb.ucdavis.edu/nemaplex/Taxadata/G145S1.HTM. Accessed 12/3/2014. Edited for the web by Laura A. Herndon. Last revision: March 2, 2015.